The champion update guys had a closer look at Alistar and decided it was time for a brush up! Weâ€™ve just finished shampooing and shearing, clipping and steering him through the champ-up workshop, and heâ€™s finally ready to stampede withÂ style. As with a few other recent updates, Alistar didnâ€™t actually require a massive gameplay or thematic overhaul, meaning we could focus on the Minotaurâ€™sÂ visuals. His updateâ€™s packed with new models and textures for all of his skins, and while we had him in the shop, we also tweaked a couple of the big guyâ€™s animations. Now Alistar will cycle through different run types as he speeds up and slows down, and youâ€™ll actually see him trampling enemies with his passive! You still canâ€™t milk those, though. Below you can find a complete preview of Alistar’s update. A new login screen will hit live with Patch 5.1 to celebrate a new season of competitive play. For a full preview of the skin, check here. For a full preview of the skin,Â check here. For a preview of Alistar’s visual update, check here. LCS icons for the new season are now available for all participating teams. [ Note ] The new Tristana ability icons from yesterday’s PBE update have been removed. They won’t be in Patch 5.1. 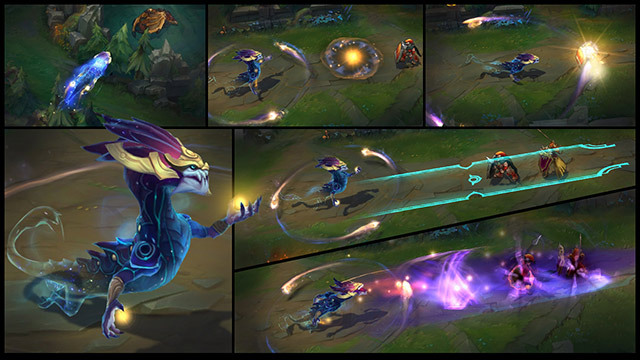 Zz’Rot Portal, the upcoming split-push item that summons purple dudes to kill turrets with you, got its in-game icons. [ Note ] In this update, you can search for Guardian’s Horn in the store by typing “Golderm Arm of Kobe”, “Golden Bicep of Kobe”, Horn, “Horn of the ManWolf” and “ManWolf”. [ Note #2 ] My mistake with the Malzahar stat buffs, the increased values are his current live. I deleted them from the post. I’ve also updated the list of changes to jungleÂ camps. Ali has received model and texture updates on all his skins. Move aside and witness Alistar, the Minotaur, in his new and updated form! Known for his ability to change the shape of a teamfight, you can now spot this cow trampling in with his shape changing form! It’s behoove of me to tell you what you can expect to see, so read up if you find yourself locking horns with the bull at any point! His model and textures are all sparkly and brand new, and his animations are tweaked a bit to make him run and look better on the fields. In addition, we’ve also given his ult a spitshine, so you’ll see some nice shields here instead of… uh… spiky… things. His skins are receiving the same treatment as well, so be sure not to miss those as well*. We’d really appreciate it if you’d take a look at Alistar, and headbutt us with any bugs and feedback that come your way. Your feedback helps to guide changes we can make, as well as helps us grow as a team. *Sweeper Alistar was fairly recent, so it did not receive larger updates. Dauntless Ahri will be available in store for 975 RP after Patch 4.21 hits live [December 23rd, assuming there are no delays] and will be a legacy skin. For her recall, Dauntless Ahri performs a dance, curls into a ball and then hovers in the air for a few seconds before returning to the fountain. The 2015 competitive season is about to begin, which means the climb to become world champions begins yet again! We’re kicking off the 2015 competitive season withÂ Dauntless Ahri! It’s a new season, which means all kinds of new beginnings – learning a new role or champion, playing with new teams, learning all of the changes. It also means bettering yourself as a player – Improve your skills, excel in your main role, rank up higher than you ever have before. NewÂ particles!Â Note: Some particles could not be changed due to gameplay clarity. Her orb and charm will remain the same color as her base. Dauntless AhriÂ is now available to play on PBE! We always find bug reports and feedback super helpful, so feel free to comment in the thread below! Likewise, if you’ve got any questions, post ’em here, and we’ll do our best to answer them! El Tigre Braum will be available in store for 975 RP after Patch 4.21 hits live. For his recall, El Tigre Braum dunks his sparring match-up, a poro. Zzrot Portal is back! You can see a preview of the itemÂ here. Now has the “Gift of the Heavy Hands” buff on, which stuns a champion every fifth basic attack. Smiting the Ancient Krug will remove its buff and grant it to you. The Krugs on Red side have switched places. Now has the “Gift of Toadstool” buff on, which causes damage-over-time to the attacker. Smiting the Gromp will, again, steal its buff.